Womp bop a loo bop, a womp bam boom! 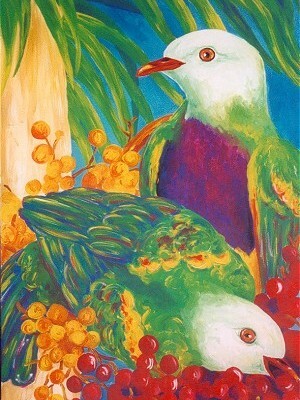 Wompoo's are the largest tropical North Queensland fruit-dove. The name refers to its extraordinary call that sounds eerily like a human voice. They feed mainly in the canopy on a variety of forest fruit including figs swallowed whole. They have incredibly beautiful plumage which is peacock green/blue on the back with bright yellow underneath the wings and yellow spots on the wings. Their belly is the most magnificent purple/blue and their heads are white. Despite this brilliant colouring though, they can be very difficult to spot in the canopy.